Developed by Pacific Coast Power & Light company, MX2002 allows us to enjoy the thrills and spills of the championship supercross without the inherent risk of breaking one�s neck in the process. Featuring Ricky Carmichael, the madman of the SuperCross world there are several options available to us. 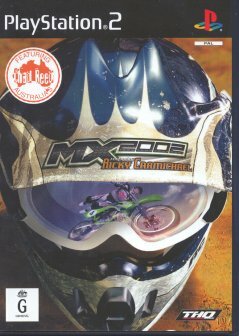 Initially I found MX2002 a little cumbersome to control until discovering the stunts available to players and 2 player race mode. This addictive feature will keep you glued to this game for hours on end. Frame rates are impressive even in split screen and gorgeous textures abound the dirt track, grass and other objects. The game has a pulsing soundtrack that will urge you to try some of the more adrenaline rushing stunts available to you. This music also gives you a stronger sense of the speed that is in this great game. The controls are easy to get used to and you will be rushing around the course and arena in no time. The only major fault I found with this title was the crash animation of the rider, it didn�t convey the same stomach churning feeling that one might find with a title such as ATV Offroad where your rider took a battering and you could see and feel it. Recovery from some stunts were a bit so so, but bear in mind it is a game and get over it and buy this title immediately.